Here is some detailed information on the process and swimming pool construction timeline. “Gunite” is a pneumatically applied concrete mixture reinforced with steel rebar. This is the most effective way of creating a swimming pool from concrete. Gunite is superior to alternative pool construction techniques such as vinyl liner or fiberglass pools in terms of structural strength and design options. Gunite is a porous concrete mixture that allows for better expansion / contraction tolerance and is less prone to cracking, shifting, translating or sinking. Our construction expertise includes inground custom gunite swimming pools. You will learn about the swimming pool building process timeline which will give you insight into planning your life around the construction. It all begins with an in-home consultation. Our pool designers have experience in creating backyard designs that blend and compliment the surrounding natural elements. You can expect your pool designer to fully understand your vision, scope, and detail. Allowing room for improvements, upgrades, and the features that will make your pool the perfect compliment to your lifestyle. While providing the elegance and functionality of your pool design, our engineers will also make sure that the project layout will satisfy all local municipal ordinances, HOA deed restrictions, and utility set-backs. You will get a personalized swimming pool design proposal package for your family to review at no obligation to you. Our pool design consultant will work personally with you to achieve the perfect combination of your pool budget and design. Based upon your approval of the final pool design and budget details our design specialist will meet with you once more to complete the agreement. After 72 hours have passed it will be time to submit the properly scaled and rendered drawings to your neighborhood association or architectural committee and the local city permitting office for approval before any work may begin. In some cases you may not be under local restrictions to build a swimming pool, in which case we can get started a little sooner than waiting for approvals from homeowners associations and the city. Experienced with local authorities, in some cases we can influence faster approval turnarounds. Delivered for you, professionally. It’s our job. 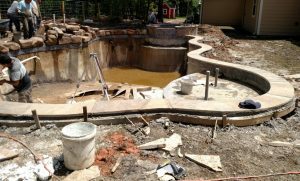 One of the most popular questions that we are asked is “how long does it take to build a pool start to finish?”. Providing allowance for weather delays, and that many skilled tradesmen do not perform labor on Sundays you can usually expect a pool construction project to take about (6) six weeks to (10) ten weeks. There are aspects of a project that might require subsequent steps, such as an outdoor kitchen or living area. 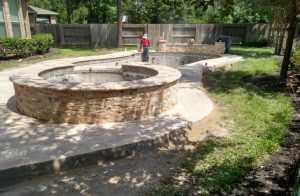 These additions to the pool project may add 1 to 2 weeks to a 6-10 week pool project depending on the scope and included features. Now here is where the real fun begins, breaking ground with the heavy excavation equipment. All has gone well, the weather is perfect and we are ready to carefully open the ground in the exact outer shape of the swimming pool. Our team of swimming pool excavation experts will amaze you with their professional abilities. It takes approximately one full day to properly excavate a swimming pool in preparation for the structural reinforcement stage. Over excavated for strength, up to 10″ standard pool floor thickness. 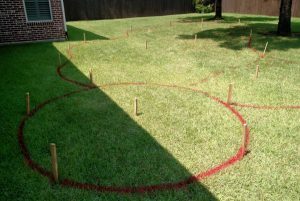 Soil reclamation, when applicable conserved for adjusting the topography of your yard for drainage purposes. Haul away excess, included when saving spoils is not applicable. For gunite pools our minimum requirement of 8″ on-center #3 rebar grid installation, and to ensure the integrity of the beam requires a 4x #4 or 1/2″ four bar boxed beam. 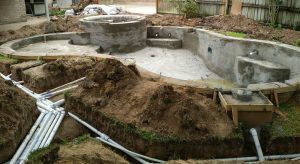 The beam of the pool is what will help to connect the outer decking slabs to the flush pool level, while also allowing for expansion and contraction of both the decking slab and the pool beam. Water weighs 62.42lbs per cubic foot, and will apply pressure per cubic foot against the bottoms and sides of the pool of up to .050 lbs per square inch. As you would imagine, when the swimming pool is full of water there are tremendous outward forces against all points of the pool structure. 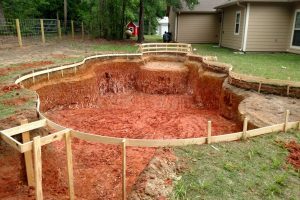 It is imperative that the proper measures are taken to structurally reinforce the shell of your swimming pool. 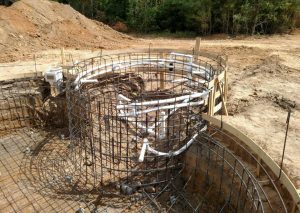 Once the structural steel has been installed into the excavated shape, it is time to install the stub-out plumbing. Referring to our detailed construction drawing for the proper placement of all water-return jets, water features, suction lines, and spa plumbing system these stub-out locations are precisely installed to maximize the performance and serviceability of your pool for the long term. 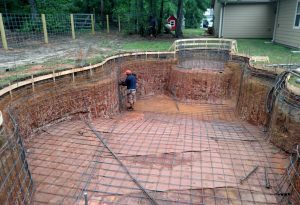 It is now time to install the gunite structural shell of the swimming pool. If you have never seen this process before you might want to take off work for half the day to watch! Or check out this video of a gunite shoot on one of our pools to get an idea! 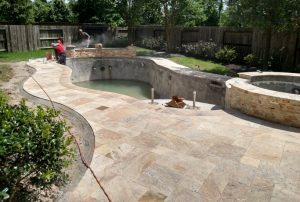 Check out the video of finished gunite below. Once the gunite material is applied to shape it will need to set for a minimum of 24hrs to harden and up to 2 weeks to fully cure in psi strength. It will be up to the homeowner to water the gunite 3 times per day for a minimum of 1 week after application. Referred to as the “Long Plumb” of the total pool plumbing system is the network of pipes that carry the water to and from the pool. It is absolutely imperative that this part of the pool plumbing system be engineered correctly. Taking into consideration every single component aspect from the swimming pool position, elevation, included water features, and the requirements for “turn-over” as according to the overall capacity of the pool and size of the pool pumps. A typical pool & spa combination will feature a network of piping that may exceed 12 total pipes in the main trench. 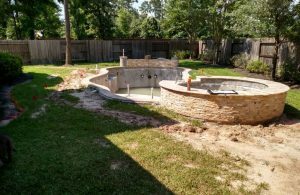 This is the stage that the pool will begin to look very interesting as our experienced tile installers will amaze you with their careful installation of all tiles and decorative stone materials. Although it is hard work especially in the heat of the summer the results of our masonry craftsmen will put your family in awe as you begin to see the formation of the beautiful natural elements. It’s time to get out of the dirt and mud! Once the decking installation is in progress you will begin to see the flow of space and functionality. Depending on your previous choices of pool decking materials the installation procedure may differ slightly. For example, if your decking choice is natural stone pavers such as travertine, it will be standard protocol for us to install a concrete substrate foundation and inset the stones with stabilized sand. We offer a complete line of pool decking types, some more common than others and some that are very special ranging from bare concrete slabs to hand crafted natural stone pavers. No matter what decking option you choose for your pool project, you can be assured that the very first step taken is on a quality foundation. We want your beautiful pool decking to last the test of time. In many cases it may take up to 2 full days and night cycles to completely fill the pool prior to the start-up procedure. During this time we will also test the functionality of all installed components to make sure everything is ready. You will not be able to swim right away until the start-up procedure has completed after or up to at least 7 days. After the plaster startup process (7 days) is complete we will seek the best schedule opportunity to provide our informative session we like to call “Pool School”. In this one hour class we will provide you with all of the knowledge you need to know about how to operate and maintain your new pool. Since every pool is unique no two Pool School classes are the same but some general rules of thumb are consistent. 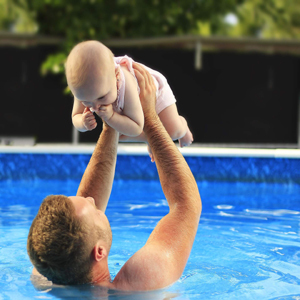 We will guide you through daily, weekly, monthly, and yearly maintenance requirements specific to your pool only. The content and references to construction timeline on this page/website is/are used as a general guideline to help explain the swimming pool construction process in more detail. 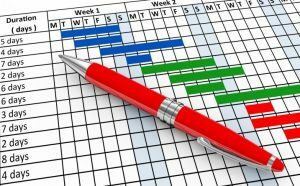 All timelines, milestones, and expectations are subject to challenges for each project thus this timeline is based on the shortest possible critical path to completion without any type of interruption what so ever under perfect work site conditions not to include time spent on any required city inspections changes or other unforeseen delays or complications. This web page is not representative of the actual agreement. 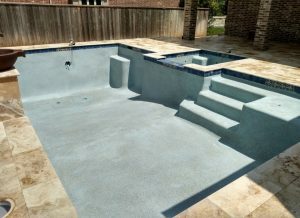 Check out the full list of areas we provide swimming pool contractor design & construction referral services in Texas.